An Irish folk song about a wake. The sheet music in the key of D for Tin Whistle is included. The Clancy Brothers And Tommy Makem song lyrics and guitar chords. I have given 2 sets of chords. The second version in the key of D Major is the same key that The Clancy's sing the song in the youtube video. 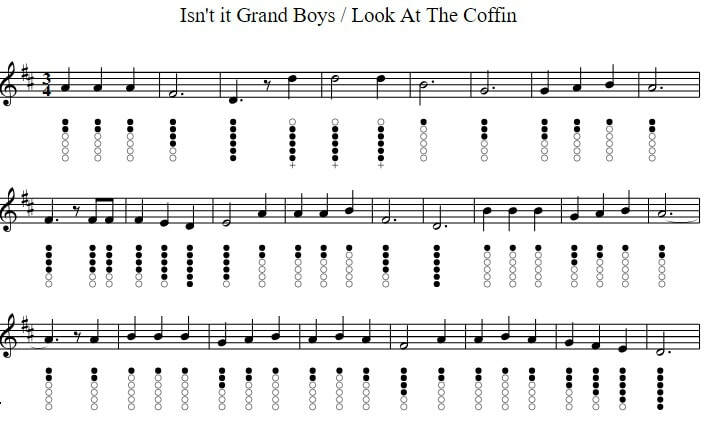 Isn't it[G] grand, boys, to be bloody well[D] dead? The[D] sooner you'll bloody well[G] die. Look at the mourners, bloody great hypocrites.. Isn't it[D] grand, boys, to [Bm]be bloody well[A] dead? The[A] sooner you'll bloody well[D] die.